Modern manufacturing conventions have produced many standard mattress and box spring sizes. Beds vary by country of origin as shown in the table below. These dimensions are for the mattress; actual bed frames are a little larger to accommodate the mattress. Mattress thickness varies considerably. 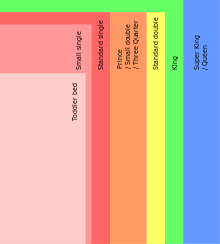 The sizes of mattresses use non-numeric labels such as a "king" or "full", but are defined in inches. Historically most beds were "twins" or "doubles", but in the mid-1940s larger mattresses were introduced by manufacturers. These were later standardised as "queen" and "king", and first made a significant impact in the market in the 1950s and 60s. Standard mattress depth ranges from the "standard" size of 9 inches (23 cm) to "high contour" of up to 13 inches (33 cm). Below are the standard ISPA widths and heights in the United States and Canada, rounded to an inch. 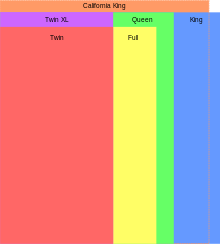 Twin or single 39 x 74 99 x 188 There is a common misconception that a single bed is sometimes smaller than a twin. King 76 x 80 193 x 203 Foundation or box spring size can be of two single L or twin XL. Bedding in the United States must state the type of bed it is intended for, in addition to the dimensions in both inches and centimetres. In the United Kingdom and Ireland beds are measured according to the size of mattress they hold, not the dimensions of the bed frame itself; bed sizes are not standardised and may differ between manufacturers. Below are the typical bed sizes from the National Bed Federation, which is the trade association for the majority of British and Irish bed manufacturers and their suppliers. Most manufacturers use a standard defined in feet and inches with the metric indicators not being exact equivalents. There can legally be a tolerance of up to +/-2 centimetres (0.8 in) in quoted measurements and the size of the mattress itself. Small Single 30 × 75 75 × 190 Common UK size for single-person hospitality (zip & link) twin beds as beds can be combined to make a short King bed. Single 36 × 75 90 × 190 Also a standard hospitality sized single-person twin bed in Ireland, two mattresses can be zip linked to make a short Super King bed. Small Double 48 × 75 120 × 190 Known also as a ​3⁄4 or a four-foot bed, for one person although can fit two. King 60 × 78 150 × 200 This is the closest bed to the American Queen size bed, 60 by 80 inches (150 cm × 200 cm). Super King 72 × 78 180 × 200 Can fit three persons. As well as standard sizes, European common sizes are also sometimes found in the UK from imports and IKEA. European Single 36 × 78 90 × 200 Two mattresses can be zip linked to make a Super King bed. Single size beds are usually 90 centimetres (35 in) wide by 190 centimetres (75 in) long. 180 centimetres (71 in) wide by 200 centimetres (79 in) long (less common, but increasing popularity). Due to the popularity of imported beds (especially from IKEA), the 200 centimetres (79 in) length is becoming more common. 80 or 90 centimetres (31 or 35 in) wide by 190 centimetres (75 in) long. 120 centimetres (47 in) wide by 190 centimetres (75 in) long. 160 or 180 centimetres (63 or 71 in) wide by 190 centimetres (75 in) long. Piazza francese or "Piazza e Mezza francese"
XL mattress sizes vary only in length but not in width. There are also extra size beds available, but they are less common. ^ a b "Mattress Sizes". Latex For Less. Retrieved 14 June 2018. ^ "1941-1965: Mattress makers introduce 'king' and 'queen' sizes". BedTimes. 10 June 2016. ^ "About the Industry". International Sleep Products Association. Archived from the original on 16 December 2004. ^ Sleep Products Voluntary Dimensional Guideline for Bedding Products and Components. International Sleep Products Association. 2001. ^ Apodaca, Frank (25 March 2017). "Single vs Twin Bed Size". The Sleep Judge. Retrieved 2 April 2017. ^ Auer, Joe (22 December 2016). "Mattress Sizes And Dimensions- A Comprehensive Overview". Mattress Clarity. Retrieved 2 April 2017. ^ "What size is a three-quarter bed?". Reference. Retrieved 2 April 2017. ^ "Handbook 130 – 2012 Uniform Packaging and Labeling Regulation" (PDF). US National Institute of Standards and Technology. 9 May 2017. p. 81. Retrieved 25 January 2019. ^ a b c "NBF Guidelines: Standard Bed Sizes". National Bed Federation. Archived from the original on 17 December 2013. ^ a b c "National Bed Federation Bed Buyers' Guide" (PDF). National Bed Federation. 2018. ^ "Trade Association Elects New President". National Bed Federation. 8 May 2018. ^ "NBF Guidelines: Tolerances". National Bed Federation. Archived from the original on 2 May 2013. ^ a b c "Mattress size guide". www.dreams.co.uk. Retrieved 31 December 2018. ^ a b "Bed buyer's guide". IKEA. Retrieved 31 December 2018. ^ Tiwatne, Sid (20 January 2018). "Mattress Dimension Guide". Nectar Sleep. Retrieved 28 March 2018. ^ "Single Bed Size & Mattress Dimensions — Standard". www.standardbedsizes.com. Retrieved 11 December 2017. ^ "中华人民共和国轻工业标准 QB/T1952.2—99 -- 弹 簧 软 床 垫". 国家轻工业局. 12 July 1999. Archived from the original on 4 March 2016. Retrieved 11 October 2015.